By hungry runner on May 23rd, 2012 . Filed under: Blogs, Cupcake Ideas . Do you like Jello shots? How about cupcakes? 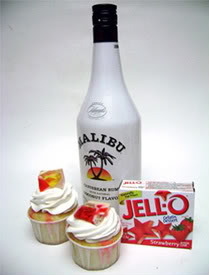 What about Jello Shot Cupcakes? I Heart Cupcakes made Jello Shot Cupcakes from a cake mix, Jello, and rum (for those of age). I’ve never been a big fan of the texture of Jello but maybe I’d like Jello in a cupcake. Our neighborhood holiday party this weekend might be the perfect time to test out this recipe.